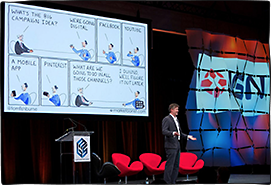 Around the executive table, marketing has traditionally had the hardest time proving their value. The correlation between marketing investment and revenue impact has often been fuzzy. Even with online transactions, it can be fuzzy. Credit has often been attributed to the last ad a customer clicked on or the last keyword searched rather than all of the activities that may have played a part. Data can be a marketer’s best friend. Marketing tools are getting better and marketers are gaining better access to data to guide decisions. We can see more detail in the customer journey. 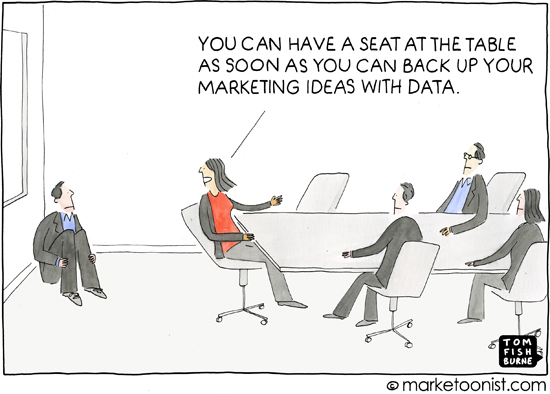 But the onus is on marketers to lead with data (without being led by data), as in this cartoon from a few months ago. In many ways there has never been a better time to work in marketing. But marketing has to earn its seat at the table. I’d love to hear your thoughts on how to navigate this. Marketing is like cooking, it’s basically facts and figures (ingredients, steps, temperatures,… vs display, click, content,…) but in the end there’s something magic that makes the difference. Great cooking can not be performed by a robot. Marketing can not be wrapped-up in data. 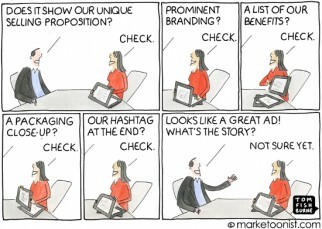 CMO have a seat at the table because data will never tell the story. The moment the brands are seen as businesses and brand teams as business units, then only will the perception of Marketing Departments as the “colouring-in department” change. The whole organisation needs to be consumer inspired and brand led, it cant just be the role of the marketing team. This means a healthy balance between quality delivery of brand experience to consumers and results to shareholders. Marketers lead by paying attention to both little data and big data. Both little data and big data are useful and both can be costly if not captured, interpreted and put into action. Deciding what story the data tells AND what it might not be telling are equally important. We must remember, Marketing is the area after the revenues; others are there for management. May the 4th be you all. There is usually no magic bullet. Just good product combined to long-term customer relationship. The CMO needs to educate its colleagues about this fact with data and not to make them believe that they will save the day with a catchy sentence. They have a place at the table to bring back the reality. When dealing with humans – and all of our emotional, irrational, complexity – data can only go so far. 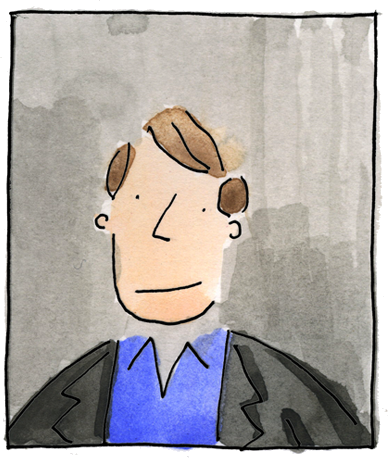 Marketing will always deal in human terms, which will always be hard to measure precisely. Companies need to embrace the messy, human side of business. For so many industries, there is a “key to entry” as a professional: tools, skills, knowledge. Understanding what data to source, sift, and analyze: these are the keys to entry for any marketing professional, social marketing or otherwise. One of the things that I particularly like about this week’s cartoon is that you are finally turning the table: the Board (or could be the C-Suite) is asking for data instead of assuming the data will be given, as a key to entry. Easy peasy. 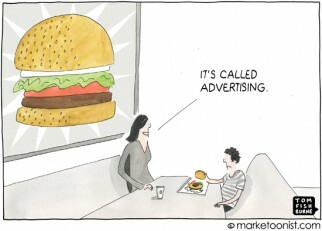 Turn off marketing…see what happens. We should begin to measure marketing in “PSD’s” (the Percent Sales Decreases we’re willing to absorb in order save money on marketing). Few people with legitimate “seats at the table” are willing to take that risk, which–it goes without saying–speaks to the value of marketing. If there is one element about being a marketer that I despise, it’s the lack of clean, measurable results; I want to know what I built when I finish work for the day. But until we can get the business world to buy into “PSD’s” (or a measure far less ludicrous), we’re going to be stuck in the corner with the dunce cap and the sideways glances from the table. Wow…I love Olivier’s comment. It really hits the nail on the head. I’m going to print it and post it on my bulletin board! Needless to say, their marketing/brand sucked. This is a fantastic cartoon, article and discussion. And I have to say, I also love Olivier’s comment – as well as all the others. How we get businesses to embrace the messy, human side of the business is the trick….what can we learn from HR? I, too, will be posting this and Olivier’s comment!! I’ve always said that marketing is happening everywhere regardless of the existence of a marketing staff. The functions that we would group under marketing can’t NOT happen, so they do happen but not as well as they would if organized and managed by a true marketing function. For example, a salesforce wants handouts for sales calls and in the absence of a managed function, each salesperson invents their own. And sales get made. Not so easy to measure is the broader perspective, long-term view of a marketing function which understands customers overall, identifies the needs and opportunities, drives the product/service development process accordingly, and prepares the organization to make sales. The important data in my mind isn’t limited to results but establishing a quantifiable understanding of the market *in advance* of investing in pursuing it. Specific to Matt’s point, it’s really hard to quantify “underperformance”. I believe many companies who may be satisfied with their accomplishments could likely have done even better if they understood how they were hurting themselves — and not just by short-shrifting marketing but in many other areas including poor leaders in key roles (have we not all seen this surprisingly often?) and other operational issues. So maybe I am Team Olivier after all — it’s not about all the nitty-gritty activities which would normally be considered marketing stuff but rather the smart, informed, engaged and ideally, respected contribution of marketing people. Very good topic, congrats Tom! My opinion on it is that first marketing should gain its place on the table. CMO should have the vision, patience, politics and ambitions to not only sit on the table, but to lead the conversation. Leading the remaining part of the management team/board of directors is the key to not only him but all his department to have the credibility and image in the organization. CMO should bring on board all MT members that he have the knowledge, skills, vision & ambition to drive the company/brands to real brand led and consumer inspired marketing. Great articlle and equally great comments. I think overall – I’d be with ‘team oliver’ as one raregift is to connect the dots (data) and create a (meaningful) story out of it. Earning a seat at the table for marketing requires both data and story telling. A good marketer searches for the best data that they can find and presents it fairly, even when it doesn’t necessarily support the case. More importantly though, the marketer needs to weave the data into a story. Our organisation has been debating the value in reusing an old brand name and versioning it for our new products. We did some brand research, we searched for similar brand names, we gathered as much data as we could and feedback for customers. In the end, the result will be a judgement call by the leadership team of the business, but the strongest influence will be the story we weave around the advantages and disadvantages of each option. For readers of this, the place at the table needs both data and storytelling, woven together to give a coherent recommendation. Here’s a different way to look at Marketing by Numbers – or Data driven marketing. What I have found to be successful is to take a 360 degree approach that puts to consumer in the middle instead of the brand or product. 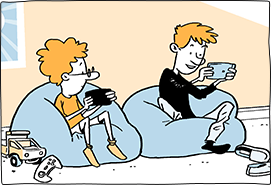 When we use data to understand their preferences, nuances, spending habits, turn offs, etc. it eliminates all that doesn’t work or is just plain wrong. From there, we can use our amazing creativity because empathy trumps brand ego. When we work from a position of knowledge, even to cite what fails, this will allow for an acceleration of success. Data can help us to see outliers that we otherwise would have missed. When we spend so much effort not to get it wrong, the cost of failure is much higher. Analytics allows us to test small, AB test, go granular with various segments, and refine our message and creative with certainty. It is not a substitution for creativity but it will identify weaknesses, for which can be overcome by creativity. Our gut is a great for driving many decisions until we get heartburn or a gastro virus. I agree with Peter wholeheartedly. Very well pointed, I am co-sharing opinion of Matt and Oliver above..